Opposition to the Transpacific Partnership continues to grow. Public concern centers on potential job loss and the ways in which corporations are likely to use their enhanced mobility to lower worker wages and benefits, weaken unions, and escape taxation. More knowledge of the agreement would produce outrage at the way its terms are also designed to block progress on climate change, raise the cost of health care, overturn efforts to regulate the financial industry . . . . well you get the idea. If it sounds like this so-called trade agreement was designed to serve corporate interests that is because it was largely written by those who represent those interests. 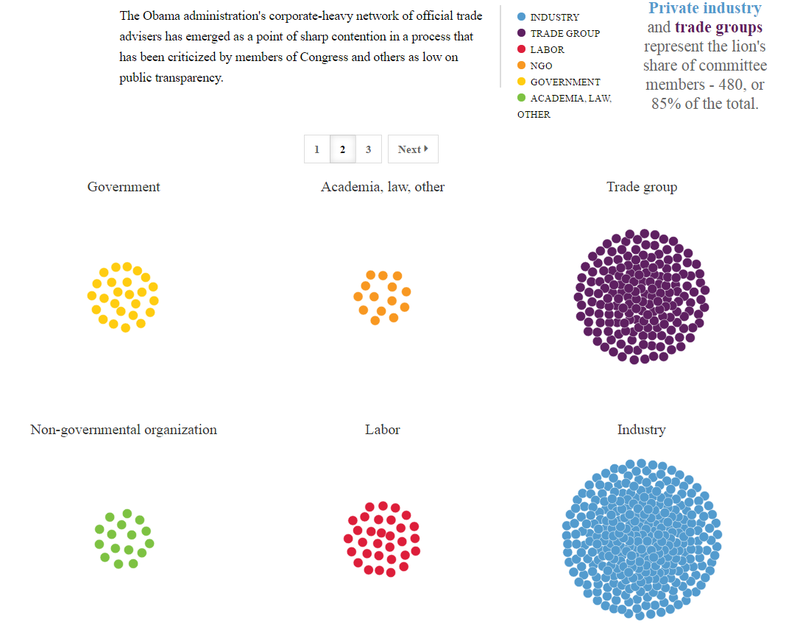 The Washington Post published some great infographics which highlight the corporate-heavy network of official trade advisers that helped shape the US negotiating position and final agreement. As you can see in the first graphic below, private industry and trade groups (which represent private industry) make up 85 percent of all the official advisers. 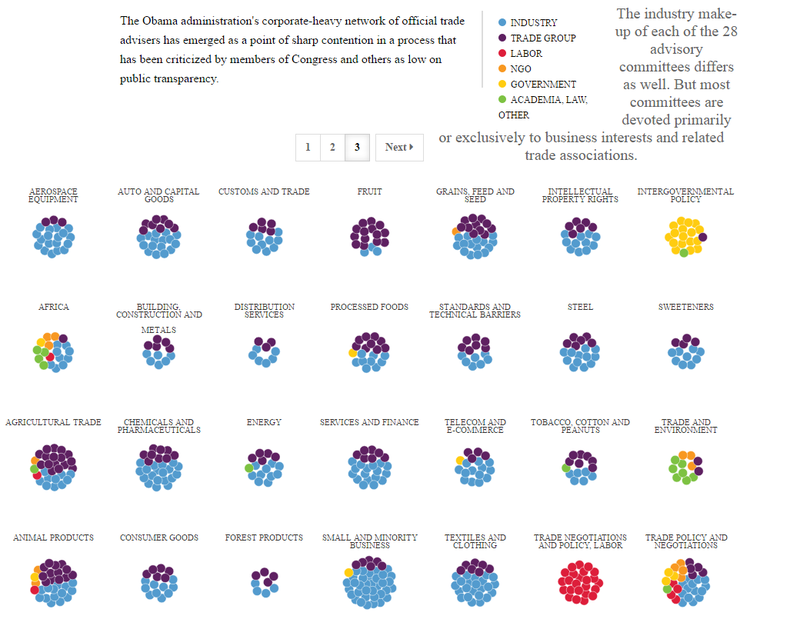 This overall breakdown, while revealing, does not fully capture the actual influence of the corporate sector. As we see in the next infographic, labor and ngo representatives are basically excluded from the key committees where the US Trade Representative’s positions on trade, investment, and finance policies are hammered out. The one committee dominated by labor, the Trade Negotiations and Labor Policy, is largely irrelevant since there are no binding labor accords in the agreement. The same is basically true of the Trade and Environment committee. The chart above shows that business has largely lost interest in using its profits to expand and modernize the US capital stock. Each point on the chart represents a five year average of investment in private, nonresidential fixed assets net of depreciation. The points are constructed using a trailing five year average to remove short term fluctuations and allow a clearer look at the longer term trend. The public is in a foul mood this campaign season, in part because living standards have stagnated. The median household income in January was slightly lower, adjusted for inflation, than it was in January 2000, according to Sentier Research. Pay is lagging partly because companies have been underinvesting in the tools that workers need to be more productive. Those tools, which range from machines to software to land and buildings, are collectively known as capital. The chart . 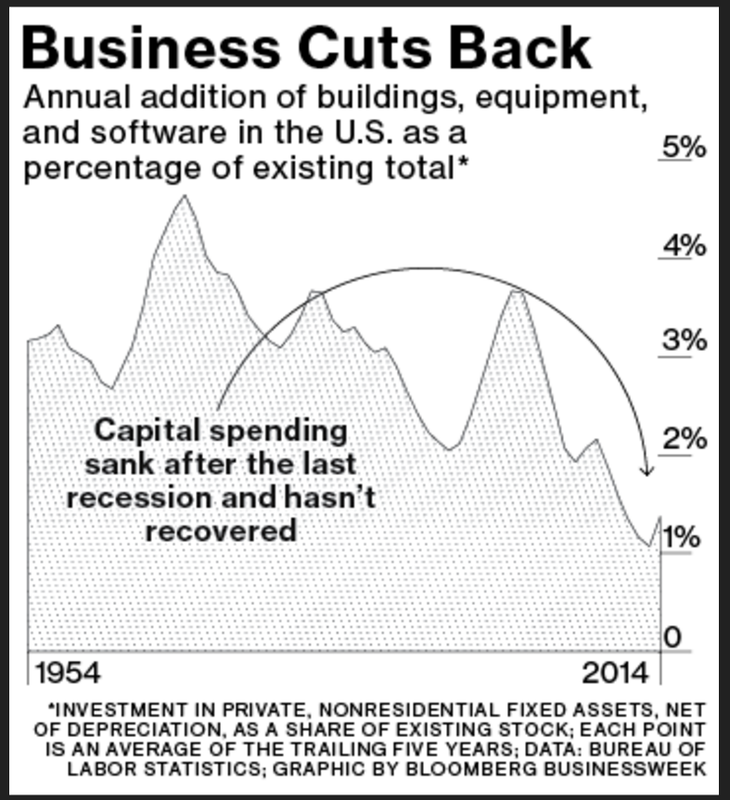 . . shows that companies are adding to the national stock of capital at an historically slow pace. In a separate calculation, the U.S. Bureau of Labor Statistics says that what it calls “capital intensity”—the ratio of capital used to hours worked—was so weak that it actually subtracted from workers’ productivity from 2010 through 2014. Investment normally falls during periods of recession. What the chart above shows is that we can no longer assume that business investment will rebound during a period of economic expansion. And this expansion has been marked by exceptionally low interest rates which should have encouraged investment. Business apparently sees few privately profitable investment opportunities and owners are content to channel profits into higher managerial salaries, stock repurchases and dividend payouts. So much for market logic which continues to demonstrate little concern with our need for investment to combat climate change, rebuild our cities and infrastructure, strengthen our education and health care systems, and the like. The Asia-Pacific region is regularly celebrated as the bright spot in the world economy, especially East Asia. This is largely because the region has been the most successful in attracting foreign direct investment and producing exports of manufacturers. Generally overlooked is the fact that these “accomplishments” have done little to create adequate formal sector employment opportunities for the region’s workers. In fact, it is likely that the region’s preeminent position in global production networks is closely tied to government policies which have kept workers in a weak bargaining position. Poor job quality is pervasive in developing Asia and the Pacific and hinders progress towards improving living standards. One indicative measure is the low share of workers in wage employment which typically is more productive and provides higher earnings. Conversely, the bulk of those workers not in salaried jobs are less likely to have formal employment arrangements and social protection coverage. In the developing Asia-Pacific region, the estimated number of wage employees totaled 766 million in 2015. While this represents a remarkable increase of 63.4 per cent since 2000, salaried workers still accounted for only two in five of the region’s workforce. Taken by sub-region, the wage employment rate was lowest in South Asia (a ratio of one in four workers). In East Asia the share was around three in five and in South-East Asia and the Pacific approximately two in five. The large number of non-wage workers, many of who are desperate for wage work, have given employers and the state a powerful lever which they have used to weaken worker efforts at unionization and wage bargaining. Since the 1990s, the UNDP has been pointing out that the outcomes of deeper integration and globalization have been unequal and uneven for most countries, especially for China. The UNDP Report for Asia-Pacific (2006) said that growth has been jobless for some Asian countries, as reflected in East Asia’s job record: 337 million jobs created in the l980s and only 176 million jobs in the l990s. The ILO Report for Asia-Pacific in 2011 also highlights the remarkable divergence between high GDP growth and low employment growth. Note that China has the highest GDP growth and yet it also has the lowest employment growth, with the exception of slumping Japan. . . . The ILO’s observations on low employment elasticities [which show the increase in employment from an increase in growth] are supported by the study of Jesus Felipe and Rana Hasan (2005), who undertook a labor market survey for the ADB. They estimated a sharp decline in employment elasticities for Asia’s fast-growing economies – China (from 0.33 in the l980s to 0.129 in the l990s), India (from 0.384 to 0.312), Malaysia (from 0.683 to 0.406), Thailand (from 0.315 to 0.193) and Taiwan (from 0.242 to 0.193). However, Singapore doubled its employment elasticity (from 0.375 to 0.711), while the Philippines registered substantial increase (from 0.535 to 0.711). South Korea’s elasticity hardly changed (from 0.223 to 0.225). One implication of the above statistics is that growth in the fast-growing economies like China and India is indeed accounted for by the increased use of labor-displacing technology, which explains why Felipe and Hasan also found a substantial increase in informal sector employment in these two countries. While the ILO focus on wage employment is important, it also matters whether the jobs being created represent formal or informal employment. In broad brush, formal sector employment refers to jobs covered by national labor law. In these jobs, workers are supposed to receive established social benefits, like unemployment compensation or pensions, and work conditions are supposed to be covered by established health and safety regulations. Wage workers employed in the informal sector are normally not entitled to such benefits or protected by such regulations. The informal sector can include both wage and nonwage workers. In Bangladesh, formal employment applies only to establishments with 10 or more employees, meaning jobs in enterprises with less than 10 employees are by implication considered informal. Similarly, in Pakistan, the measurement for formal employment is in terms of the number of employees – 20 or more for nonindustrial and 10 or more for industrial establishments. In India, informal employment is simply any employment outside the “organized sector” consisting of the public sector, recognized educational institutions and enterprises registered under the Indian Factories, Co-operative Societies and Provident Fund Acts. In Indonesia, the informals are the own-account workers, self-employed assisted by family members, farmer employees and unpaid family workers. In the case of the Philippines, informal employment includes the self-employed, unpaid family workers and those employed in enterprises with less than 10 people. Thailand, on the other hand, has introduced a more nuanced definition: “informal sector” includes enterprises operating with a low level of organization on a small scale, with low and uncertain wages and with no social welfare and security. Malaysia’s informal definition is focused on the individual workers – the unprotected workers who are not covered by the social security system or the Employees Provident Fund and the self-employed, including unpaid family workers. China defines the informal sector as the totality of small-scale economic units that are not legally established or registered, consisting mainly of micro enterprises, family enterprises and independent service persons. According to ILO estimates, approximately 65 percent of non-agricultural employment in the Asia-Pacific region is informal employment. More alarming is the fact that formal sector wage employment appears to be shrinking in many countries, often both absolutely and relatively. In “Misleading Chinese Legal and Statistical Categories: Labor, Individual Entities, and Private Enterprises,” a 2013 article published in the journal Modern China, Philip C.C. Huang describes the evolution and application of Chinese labor law, highlighting its relevance for and growth of different categories of labor. As he explains, Chinese statistical categories recognize four main types of labor activity based on the legal standing of the employing firm: labor by “employee-workers,” labor by workers employed by legally registered “private enterprises,” labor by people in legally registered “individual entities,” and “unregistered” labor. Only “employee-workers” are considered formal sector workers and covered by the country’s labor law. . . . Significantly, as the next table illustrates, both the number and percentage of workers employed in the formal urban economy are shrinking. The number employed in the formal economy in 2010 was less than the number employed in 1990. 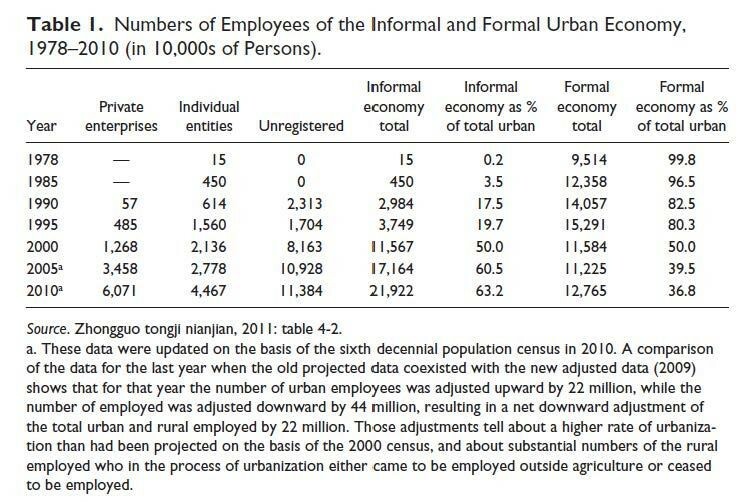 As of 2010, only 36.8% of all workers in the urban economy were employed in formal sector jobs. In short, all the growth in urban employment over recent decades has been in categories not covered by Chinese labor law, which means that those workers are not covered by legally established minimum wage, overtime regulations, and social benefit requirements. Unregistered workers “appear in the official state statistical tallies only as the difference between those who have registered with the official state administrative entities and the actual numbers of laborers counted up by the decennial population censuses (which have made every effort to enumerate every person living and working in the cities).” As we can see from the table above, the number of unregistered urban workers are quickly catching up to the number of formal sector urban workers. The critical point here is that despite record rates of growth few formal sector jobs have been created in urban areas. That means that official Chinese labor laws and regulations cover a relatively small and declining share of Chinese urban sector workers. . . .
At the same time, things are far from rosy for most formal sector workers. For example, many companies, especially foreign owned companies, have been actively seeking to weaken formal sector job rights by employing so-called dispatched workers and student interns to avoid paying the wages and benefits mandated by Chinese labor law. It is therefore not surprising, as recent labor struggles make clear, that even workers in the formal sector have been forced to take direct action to ensure compliance with their country’s labor laws and improve their working conditions. In Korea, workers are said to have regular or irregular rather than formal or informal labor market status. The category of irregular workers includes limited-term workers “whose termination of employment is predetermined or fixed”; part-time workers “who work less than 36 hours a week”; and atypical workers who are dispatched workers, subcontracted workers, specially-employed persons, independent contractors, and home-based workers. According to attorney S. Nathan Park these terms “are shorthand rather than precise legal definitions. Broadly speaking, a regular worker is a worker who receives the fullest benefits afforded by Korea’s labor laws; an irregular workers is a worker who does not.” The latter could be anything from a sub-contracted worker doing a one-off job to an office worker on a short, two-year contract. The Korean government has been actively promoting, in concert with large Korean firms, the growth of irregular employment. In many cases this is being achieved through the introduction of laws that allow corporations to transform work relations, converting regular into irregular work. For example, until the late 1990s, labor regulations made it difficult for corporations to fire workers or to make significant use of sub-contracted workers, workers dispatched from a temp agency, or workers hired on a temporary contract. The regulations were changed, enabling large companies to aggressively shed their regular workers, either replacing them with or rehiring them as subcontracted, dispatched, or temporary labor. “Each company and industry makes its own determination as to what percentage of irregular workers represents an optimal balance in terms of performance, and that forms the basis of their hiring strategy,” explained Lee Kwang-ho, head of the employment policy team for the Korea Employers’ Federation. The overall number of irregular workers in South Korea has hovered between 8.18 million and 8.65 million for the seven years since the Fixed-Term Worker Act was enacted in July 2007. The increase has appeared to level off at times, but the number has been more or less set in stone, with legislation, institutional changes, and labor union struggles failing to put a dent in it. The recent data now show one possible explanation: identical hiring strategies by chaebol [large Korean conglomerates], all of which maintained set percentages of irregular workers through large-scale hiring of “unaffiliated” dispatch workers and subcontractors. In the past, employers’ groups have pointed to the low percentage of irregular workers hired by companies with over 300 employees as indicating the situation is basically unfixable. They noted that such large companies accounted for just 5.6% of irregular workers in August 2013, while most of the rest were at small workplaces with a staff of 30 or fewer. But the employment information data now shows that the companies have been breeding grounds for irregular hiring practices. “Analysis of the data provided by the companies shows that 1,910,000 of the 4,358,000 salaried workers at companies with over 300 employees, or about 43.8%, are irregular workers,” said Kim Yu-seon, a senior research fellow at the Korea Labour and Society Institute (KLSI). The nearly identical percentages of overall irregular workers – 45.4% of all salaried workers or 8.52 million people as of August, according to KLSI – and irregular workers at large companies suggests that those companies are at the heart of both the problem and its resolution. This 45.4 percent figure doesn’t capture the full extent of irregular work in South Korea. Adding self-employed independent contractors, home based workers, and day laborers brings the share of irregular workers to approximately 55 percent of the waged workforce. Moreover, the Korean government is now aggressively promoting still new changes to the country’s labor laws which will further the growth of irregular work. For example, proposed reforms will increase the number of industries allowed to use temporary workers and double the length of time that a worker can be employed on a temporary basis, from two years to four years. And there is nothing in the law that prevents a company from continually rehiring the same worker on the same temporary contract. This transformation of Korean work relations has greatly increased corporate power at worker expense. First, workers are being stripped of their job security and their ability to organize and negotiate over their working conditions. Second, companies are able to greatly reduce their wage and benefit costs. For example, irregular workers currently earn approximately 54 percent of what regular employees earn for similar work; it was 65 percent in 2004. China and South Korea are just two examples. Similar trends exist in the majority of countries in the region. The takeaway: capitalist globalization dynamics are not leading to the creation of stable, formal labor sector jobs, even in the region with the most dynamic economies. In fact, current trends in many countries suggest that the reverse is happening, that the drive for profit is encouraging the growth of ever more precarious work and the associated worsening of majority living and working conditions. At the same time, there is growing labor resistance to this development. Examples include the recent general strike in Indonesia, widespread labor actions in China, massive demonstrations in Korea, and general strike organizing in India. In sum, the Asia-Pacific is becoming a region of active national labor struggles for change.